On this page I want to give a small overview about the historic delevopment of all Intend Forks. I will sum up the models, the compatibility of axles, adapters and all you have to know. Here you can see V0 Prototype (right) and the V1 Prototype. 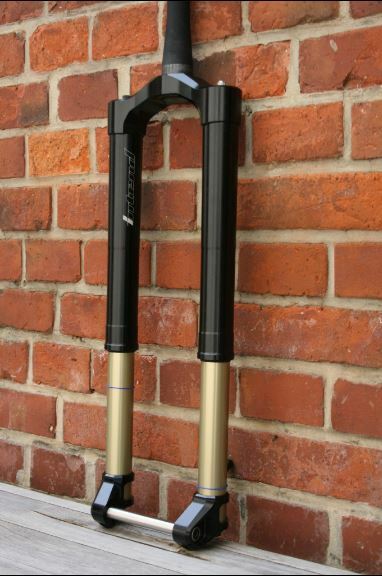 The right one was a mix out of shortened White Brothers uppers, Manitou Dorado Dropouts, X Fusion steerer and so on. This fork didn't work quite well. But it worked and I made my first experiences with seals, bushings, tolerances and so on. V1: The left one was the next step. 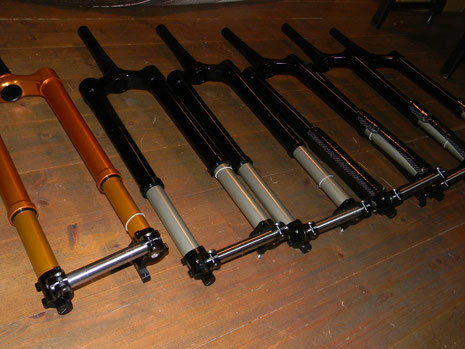 Every part of the fork was designed on my own, also the complete damping structure as well as air spring parts. This Prototype is still possible to ride, but I have no bike for it. 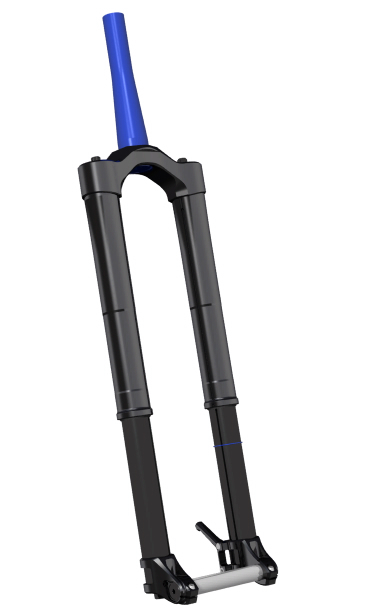 V2 Forks, called SC166. 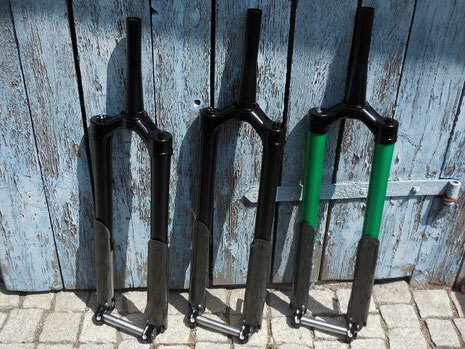 This three shown forks are the very first sold forks in Intend's history. The internals where handmade from a young guy in Berlin, the funny thing is, that in this time (around 2015) I had not the experience which I have now, but I didn't get any of the forks back. They still work and ride out there. Originally there have been two customers and I planned the third fork for me. But then a third guy wrote "can you make one for me as well?" And I decided not to have a own fork and I sold all three. I was so extremely proud, this picture shows the very first parts which ever have been aimed to sell. For V3 I updated all internals with the experiences I learned from V2, the outer chassis stayed the same, but I did some new internal updates and made a series of 11 pcs. This V4 model (Edge & Infinity ) was my step into series business. 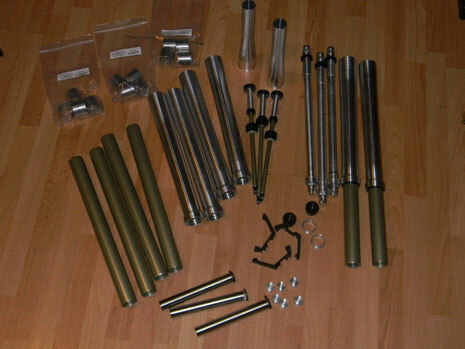 I started completely new, searched for own suppliers for every part, also for the lowers, rods, bushings. From this version on I have compatibility for following parts: Brakemount, axle, rods, busings, seals, stanchions. - 27,5" and only 6 pcs in 29"
V5 - the current version. End of 2017 it was obvious that only boost will survive. I had to make a boost version which also fits to 110x15 axles. 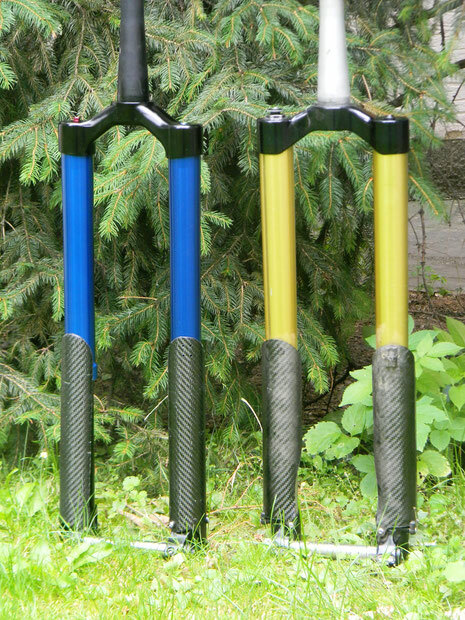 It is bad for USD forks, but all the customers didn't want to change her existing front hubs. So I made the Boost Edge with adapters for 110x15 axles. - crown and dropouts have now 150mm distance instead of 140mm from V4. That's why it is not possible to change dropouts from V5 to V4. You can easily find out if you have this version if the tube-distance is 150mm.